Boulder City High School’s girls volleyball team picked up its biggest win of the season Monday, rallying to defeat rival Moapa Valley 3-2. 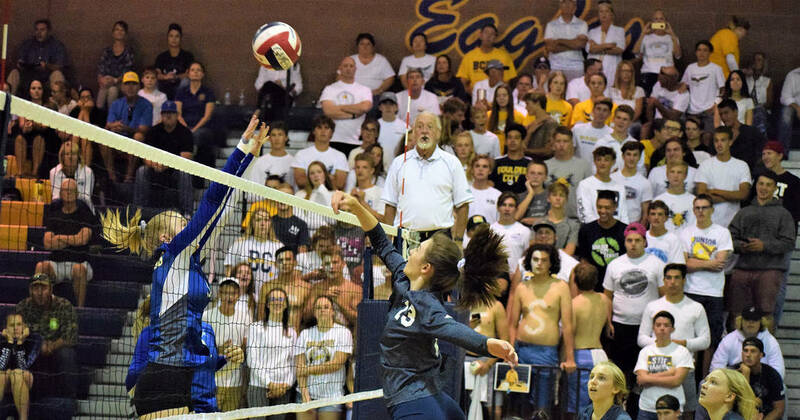 Robert Vendettoli/Boulder City Review Boulder City High School junior Raegan Herr added 10 kills to help the Lady Eagles defeat Moapa Valley in five sets Monday. Steady with the Pirates throughout the night, the Lady Eagles dropped the first two sets before rallying back for three straight victories in a 22-25, 23-25, 25-23, 25-16, 15-7 home victory. A rematch of last season’s 3A state championship match, Monday’s contest brought a high intensity level for both teams. The Lady Eagles (9-4) didn’t back down from the challenge, proving that they are favorites to repeat as 3A state champions. They were sparked offensively by senior Setia Cox and sophomore Kamry Bailey. Playing her best game of the season, Cox had a game-high 17 kills, while Bailey added 13 kills with13 digs defensively and five serving aces. An offensive showcase against the Pirates, junior Raegan Herr racked up 10 kills, while sophomore Sierra Orton added 11 kills. Sophomore Ava Wright fueled the effort with 51 assists. “This win definitely helped boost our confidence and shows that we are back and ready to fight for the title once again,” Cox said. Freshman Zoey Robinson added 11 digs defensively, while Herr and sophomore Kelsi Robinson each added four blocks. Boulder City will now focus its attention on Sunrise Mountain for a road game Tuesday.